The price action suggests this rally isn't over yet. Fewer than four weeks into 2019, and this market feels completely different from the one we left behind back in December. New month, new market indeed. The selling investors experienced in the fourth quarter of 2018 may have been jarring - even on a historical basis - but it's given way to a sharp rebound that's propelled the S&P 500 5.6% higher on a total returns basis year-to-date. Just in case that doesn't sound like a massive about-face, consider this: If the S&P 500 continued its current pace for the rest of 2019, we'd end the year with a 128% total return for the stock market. Clearly, that's not a sustainable upside-move for stocks. But in the context of the selloff we just experienced, it's less worrying. Likewise, investors are beginning to bet that this earnings season could help keep the rally alive. But there's another reason to believe that stocks could have more room to rebound; from a long-term technical standpoint, current market conditions mirror those that have driven rallies. With more than three weeks in the rearview mirror, support appears to be holding right on cue. The long-term trendline support level that's acted as the do-not-cross line for this multi-year bull market held up. You don't need to be an expert trader to figure out the fact that when you're in a "buy the dips" market, it makes sense to buy bounces off of support. 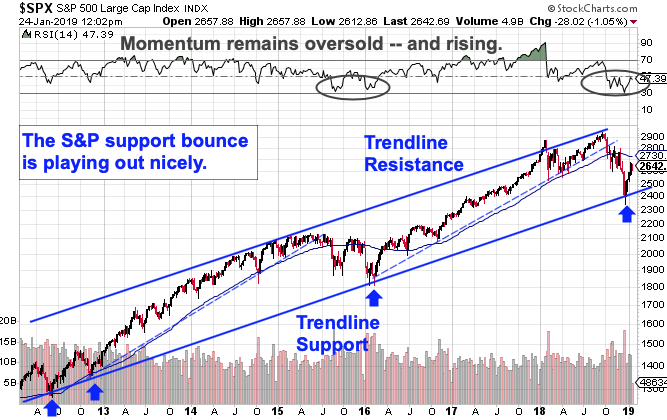 Even more promising, long-term momentum remains oversold yet rising - arguably the best possible scenario for a rally. The rate of the rebound is still an issue. If we look at 2016's support bounce as a potential proxy for this one (like we did back at the beginning of the month), then it's clear that 2019's bounce is happening much faster and potentially less sustainably. Still, a correction in the near term (even a sideways one) wouldn't be a contradiction for the S&P's trend to continue to hold in the long-run. As always, risk management is crucial. While the trend channel in the chart above does plot the high-probability range for the S&P 500 to stay within from a technical analysis standpoint, it doesn't guarantee anything. The S&P 500 could certainly violate its long-term uptrend, opening downside risk as demand for shares fizzles. But, as long as the S&P stays above trendline support (currently just above the 2,400 level), it makes sense to stay bullish about 2019's prospects for investors. Long term, we're still in a "buy the dips" market.